The death of Michael Jackson made me think about how much we are uplifted by great performers and how much performance has meant in my life to date. I was always a Drama Queen (I can hear some of you saying WE KNOW!). As a small child I remember loving the dressing-up-box and putting on little shows in the garden for my friends. Then there was dancing for the Cadbury factory fete as part of my junior school Irish Dancing team – complete with beautifully embroidered green and gold dress and cape. The first ‘proper’ play I remember appearing in was Aesops fable ‘The Belly and the Members’ where I played The Belly with a biscuit tin stuffed up my costume! Soon I graduated to musical theatre in ‘Salad Days’ and then Shakespeare as Hero in ‘Much Ado About Nothing’ which began a life-long love of the Bard (with a published book in 1977). By my mid-teens I knew that theatre was for me and at 19 I found myself performing in the West End with the National Youth Theatre and then gaining a coveted place at the Guildhall School of Music & Drama in London for professional training. Throughout my adult life I have had the pleasure of performing on stage numerous times in recitals, concerts one-woman shows and have acted or directed over 40 plays, musicals and pantomimes. As a fully paid up member of Equity I continue to keep a strong focus on all things theatrical and whenever I get a free night I’ll be having a ‘busman’s holiday’ and taking my seat in the auditoriam. So what has being a performer taught me that I can apply to my business life? Well, that people work best when they work with passion and commitment; that if we work as a team we can acheive more by sharing the load; that good oral communication ensures a clear message and therefore faster results. I suppose that is what I try to convey in my 1-2-1 sessions and workshops. Everyone has a bit of a performer in them. Even someone who is basically shy can find a little spark which will affect another human being. Sometimes we just have to allow our feelings out because people buy people, rather than a business. If you think your spark is still lying hidden – you know where I am! What have I been up to in June? Examining took me to Sheffield for three days and also to Leamington, Nottingham and Bedford. I did some breakfast meetings for 4Networking at Derby and Birmingham, a lunch event at Leicester organised by Network Midlands and The business Club and an evening event supporting ‘Women in Business’at Stratford. 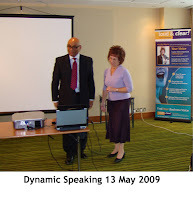 Early in the month I did a short ‘Something to Shout About’ session for a womens’ network in Burton-on-Trent and later an interactive seminar in Birmingham for the Lyness group network. As a direct result of this I will be taking a 1/2 day ‘Voice Matters’ course for a company in Manchester during July. I was delighted to be involved in LeicestHERday on 12 June. It was an inspirational day held at the Walkers Football Stadium which had excellent conference facilities. I was taking one of the table workshops in the afternoon for the education and training section and thoroughly enjoyed the day. I was an exhibitor at a business to business event at the new Bingley Hall, Birmingham organised by Switched-on-Biz At the same event I had the pleasure of being one of the 5 key-note speakers. My presentation included the story of my business success over the last 37 years and a recital entitled ‘It’s a Dog’s Life’ in aid of Guide Dogs for the Blind which Angela Agnew, of ‘Switched-on-Biz’ supports. I also had some related news which was quite a surprise – I have got to the final in the awards for ‘Women in Business with B***s!’ Don’t laugh please. I shall be donning my posh frock and heading for the New bingley Hall on October 1st so wish me luck. Stewart and I attended an EMITA event about working in Hong Kong and China. As some of you know I judge at the speech festival every two years on Hong Kong island and I believe my voice coaching could be very popular in the business community. We are pursuing several avenues and will let you know the result. If you have any business contacts in Hong Kong who you feel might be intersted in talking to us in November/December please ask them to get in touch. I held my latest ‘Voice Matters’ open workshop at the Marriott hotel, Leicester on 16 June with another set of mixed business delegates. Again, there was excellent feedback and I’m now booking workshops numbers 8 & 9 for 17 September, Leicester and 21 September, Solihull It wasn’t all work though. I went to see an excellent youth production of Andrew Lloyd Webber’s early musical ‘The Likes of Us’ about the founding of Dr Barnados. Although it was really only songs linked by narrative, the production by the Concordia Youth Theatre was really terrific – what talent and condidence they showed. I also really enjoyed ‘The War of the Worlds’ musical extravaganza at the National Indoor Arena. I went with an old school friend (that is length of friendship – not age!) and it was a trip back to my youth. You can’t beat the vocal tones of Richard Burton! Finally, back to the performing arts. I’ve been fortunate to help five students gain places at major training establishments for acting and musical theatre. They have 2 places at Guildford Conservatoire, 1 at Arts Educational and 2 at Mountview, london with several gaining full scholarships – my work is sometimes very rewarding. So, do you have any ‘performing’ stories to share with me? Have you ever ‘trod the boards’ or taken on a persona in the cause of art or business?